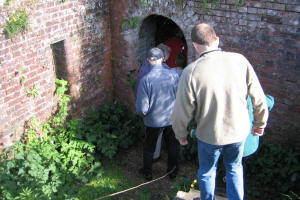 This rally was located at two forts (Fort Purbrook and Fort Widley) situated on the top of Ports Down overlooking Portsmouth and with a view to the Isle of Wight. 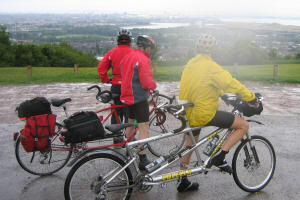 After weeks of hot, sunny weather, forecasts for this week were dire with high winds and rain forecast. 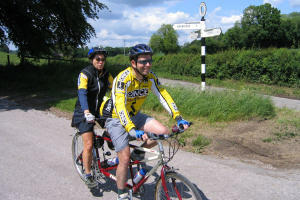 They turned out to be largely accurate although we did also have some very pleasant periods. 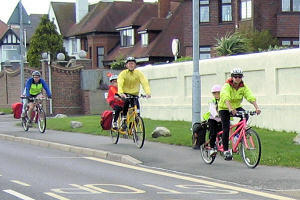 The weather was showery and windy. 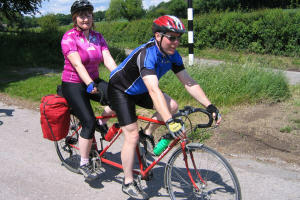 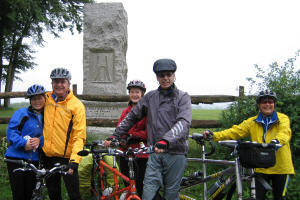 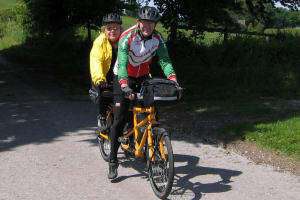 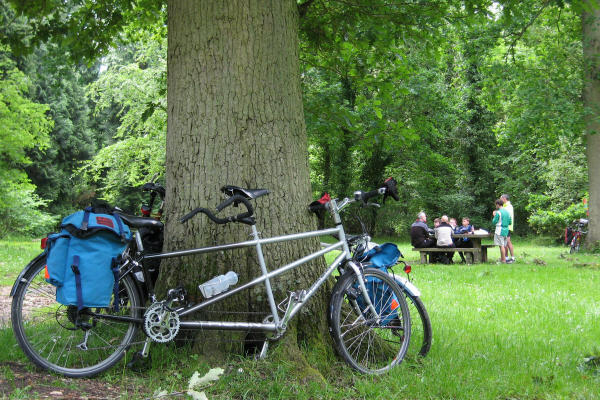 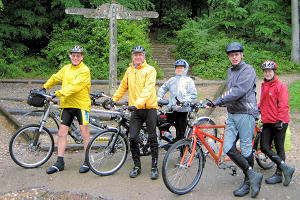 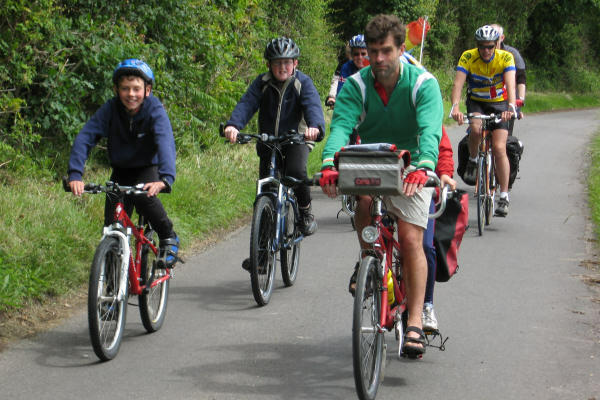 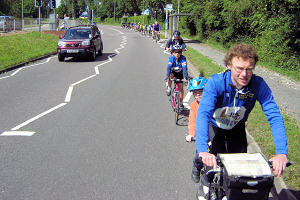 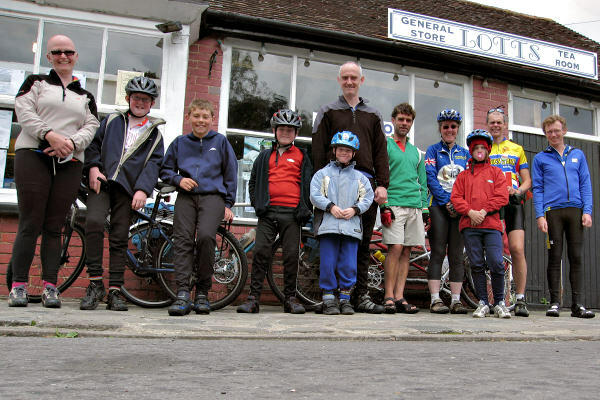 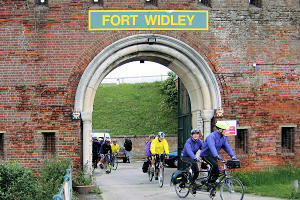 Some tandem teams from Fort Widley set off in a northerly direction heading for Queen Elizabeth Country Park where we knew there was a welcoming café. 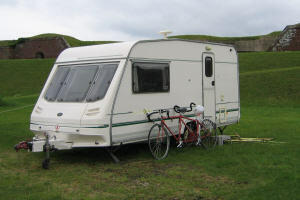 The weather overnight had been very wet and very windy with at least one tent at Fort Purbrook being demolished by wind and rain and most of the caravan awnings at Widley, that were not taken down previously, were damaged by the wind. 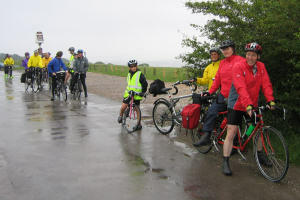 The following morning was wet and very windy and most people spent the day cowering at their bases rather than risk being blown off their tandems! 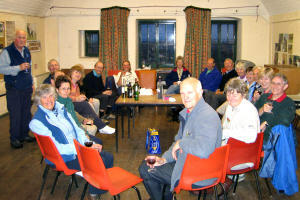 However, despite the poor weather we did have a very pleasant social gathering in the evening in the fort. 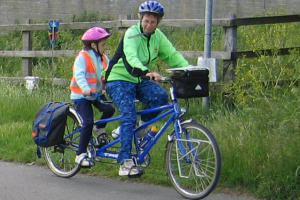 We did this each evening. 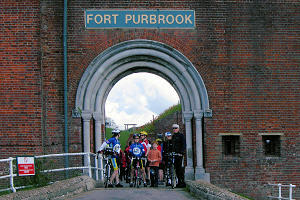 Evening functions also took place at Fort Purbrook  a Table Top Sale, slide shows by Mike Edwards and Keith Wileman, a quiz and Mike Edwards displayed his vintage bikes. 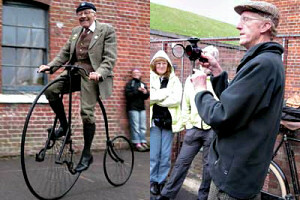 of his vintage bikes and Keith Wileman demonstrates old bicycle lamps. 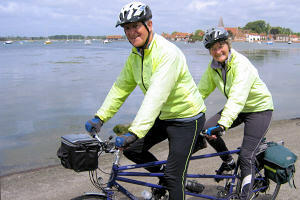 Note: click here to see more from Mike and Keith's Vintage bicycle show. 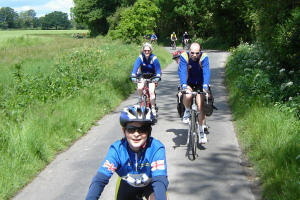 Tuesday dawned sunny and 8 tandem crews from Widley set off promptly at 9:30, heading in a northwesterly direction towards Brambridge with refreshment stops on the way out at Bishop's Waltham and another on the way back at Wickham. 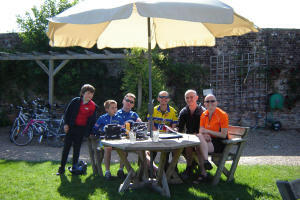 The Family ride from Purbrook went to Fishbourne Palace near Chichester. 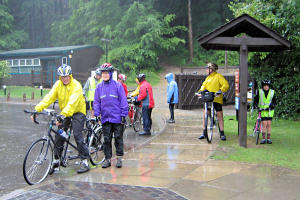 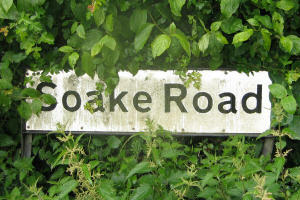 Today was wet! 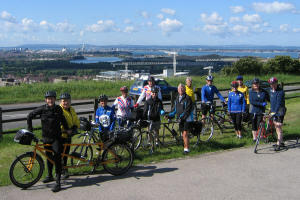 Nevertheless we had a very good turnout comprised of teams from both forts for our ride to the north - stopping again at Queen Elizabeth Country Park. 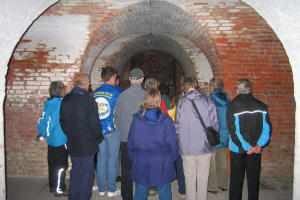 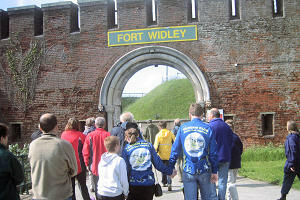 In the evening we had a very interesting and informative walking tour of Fort Widley. 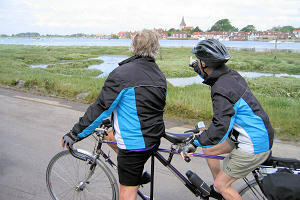 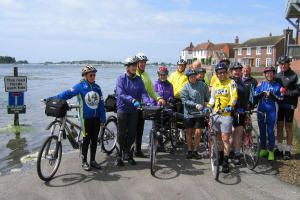 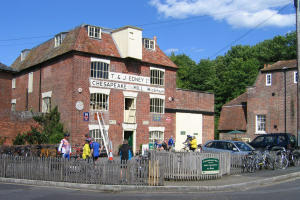 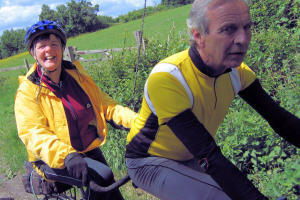 The final day was sunny and Brian and Chris led the Widley group on a ride to Bosham and Chichester. 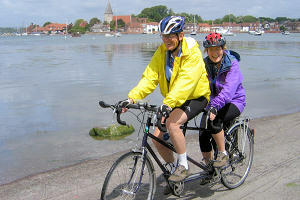 Bosham - "This road floods each tide"